Andrew Cuomo is currently the governor of New York and has long been viewed as politically ambitious with an eye on the White House. His chief assets include a famous name in Democratic politics, prime access to New York’s fundraising circles, and a record as governor that will generally please Democratic constituencies in a primary contest while offering a few nuggets to independents concerned about education and business growth, among other issues. While Cuomo has many attributes that could make him a strong contender for the 2016 Democratic nomination, there has been little if any effort on his part to pursue a campaign, and at this late date it is highly unlikely that he will enter the race. Cuomo has more than 30 years of serious political experience, going back to his father’s campaign for governor in 1982. He has been through U.S. Senate confirmation hearings and four statewide campaigns in New York, three of which he won handily. His first campaign ended before the primary when he withdrew following controversial comments regarding Gov. George Pataki’s performance during the 9/11 attacks. His record as governor has not been a conventionally progressive or liberal one, as he has fought with teacher unions to improve education and sought to cut business taxes. On social issues he has toed the liberal line, however, which may play well in New York and Democratic primaries but could hamper him in a general election. His administration banned fracking for oil and gas, and he has been a supporter of Obamacare. As is typical of many governors, Cuomo does not have much of a track record on foreign relations or defense policy. As governor of New York state and attorney general before that, he likely has been well briefed on terrorism threats however, which is likely to give him a different or at least better informed perspective than some of his potential 2016 rivals. A Cuomo campaign in 2016 would be able to appeal to nearly every constituent group traditionally part of the Democratic coalition, including environmentalists, feminists, most public and private sector unions, business interests heavily reliant on preferential treatment from the government, housing and poverty activists, trial lawyers, and others. Teacher unions are likely to look elsewhere in the nomination battle because of his support for charter schools, but would likely be reliable supporters in the general election, as they were with President Barack Obama (another charter school supporter). Cuomo might also have trouble attracting the support of hard-core anti-business activists as a result of some of his pro-business (but not pro-market) policies, and his occasional clashes with New York City Mayor Bill de Blasio may also drive some potential supporters to more populist, anti-business candidates. A national campaign would likely expose Cuomo to significant scrutiny over ethics and corruption, and unlike 2008, when Obama had a shallow enough record in Illinois politics to plausibly claim he was not part of the corruption endemic to that state, Cuomo’s long history of involvement in New York politics may not be so easily overlooked. The most likely (and possibly only) scenario for a late entry by Cuomo into the 2016 contest would require a serious collapse in support for the current frontrunner, former Secretary of State Hillary Clinton, along with a decision by Vice President Joe Biden to stay out of the race. Under such circumstances a “draft Cuomo” movement could potentially arise out of Democratic leaders’ concerns about the stature and electability of the remaining candidates. A sitting governor of New York who comes with a substantial and generally liberal record in office, a relatively well-known and respected political name, and access to major fundraising networks, could be an easy choice for party insiders desperate for options. Andrew Mark Cuomo was born on December 6, 1957, in Queens, New York. He is the eldest of 5 children born to Mario Cuomo and Matilda Raffa Cuomo. A Roman Catholic, Cuomo attended St. Gerard’s School and the prestigious Archbishop Molloy High School in Queens. He received his bachelor’s degree from Fordham University in 1979, and his J.D. from Albany Law School in 1982. Following his graduation from Albany Law School, he joined his father’s campaign for governor of New York as an adviser and campaign manager. After helping to guide his father to a narrow 2-point victory over Republican Lewis Lehrman, Cuomo was named to manage the gubernatorial transition committee. He was later elevated to the role of special adviser to the governor. 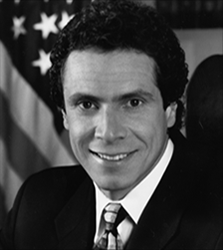 In 1984, Cuomo was appointed a New York assistant district attorney. During that time he founded Housing Enterprise for the Less Privileged, or HELP, a nonprofit organization with the goal of providing housing and support services to help the homeless become self-reliant. After a brief stint at the law firm of Bultrich, Falcone & Miller, Cuomo left in 1986 to manage HELP full time. His work with HELP lead to an appointment as chairman of the New York City Homelessness Commission from 1990-1993 in the administration of New York Mayor David Dinkins. Cuomo was appointed Assistant Secretary for Community Planning and Development in the Department of Housing and Urban Development in President Bill Clinton’s administration in 1993. After HUD Secretary Henry Cisneros resigned under a cloud of controversy and scandal in 1997, the U.S. Senate unanimously confirmed Cuomo to succeed Cisneros. He continued to serve in that role through the end of the Clinton administration in 2001. Cuomo made his first run for governor of New York in 2002, challenging sitting GOP Gov. George Pataki. He withdrew before the primary election after making comments criticizing Pataki’s handling of the 9/11 terrorist attacks that were criticized and denounced by many, including Cuomo’s own father. Making his second run for statewide office, Cuomo declared his candidacy for New York attorney general in 2006. He captured the Democratic nomination, and went on to win the seat with 58 percent of the vote in the general election. After serving one term, Cuomo declared his intention to run for governor in 2010. He easily captured his party’s nomination, and handily defeated Republican nominee Carl Paladino, taking over 62 percent of the vote. He was easily re-elected to a second term in 2014, winning 58 percent of the vote against Republican Rob Astorino. Cuomo was married to Kerry Kennedy — the seventh child of Robert F. and Ethel Kennedy — from 1991 until they divorced in 2005. They have three children together: Cara, Michaela, and Mariah. Since 2011, Cuomo has lived with Food Network host Sandra Lee in the home they share in Westchester County, New York. Cuomo also pushed off politically charged decisions on fracking, bridge tolls, and upstate casino locations until after his 2014 election, preventing voters from knowing where he stood on those key issues.6 Otherwise, Cuomo has largely pushed policies and issues that he campaigned on, and there are few notable reversals. Cuomo’s time at the Department of Housing and Urban Development had its controversial moments, as well. Cuomo has not backed down from powerful Democratic Party interests, particularly the state teacher unions. He has referred to public schools as having a “monopoly,” asked for more rigorous accountability standards for teachers, and backed both charter schools and tax credits to expand educational choice.11 All of these positions are loathed by most progressives and organized labor. While Cuomo isn’t regarded as a poor communicator, he often pales in comparison to his late father. Mario Cuomo is well remembered for delivering the keynote speech at the Democratic National Convention in 1984, regarded by some as one of the great political rhetorical performances of all time.12 Andrew Cuomo has no similar major speeches or similarly lauded rhetorical performances to his credit. Similarly, Cuomo has not faced any significant debates in his previous elections. Cuomo is politically well connected. In this area, he benefits from his father’s past political office, as well as his connections to Bill and Hillary Clinton from his time as HUD secretary in Clinton’s administration. If Cuomo were to run for higher office, he would likely be able to count on significant support from nearly every major constituency group that forms the core of the Democratic base, including environmentalists, social liberals, and organized labor (except for teacher unions). While other states in the nation have benefited immensely from the process of hydraulic fracturing, or fracking, and the jobs, personal wealth, and tax revenue it has created, New York instituted a moratorium on the process in 2010.27 In 2012, Cuomo announced that the state would consider lifting the ban.28 But, in December 2014, after Cuomo had secured re-election, he announced that the state would adopt of ban on fracking.29 He does not appear to have taken a position on the Keystone XL pipeline. He has yet to take any significant action on entitlement and welfare reform as governor. Cuomo has also supported tax credits and subsidies for green energy initiatives. In 2013, Cuomo signed an extension of the state’s Film and TV Post-Production Tax Credit, which offers $420 million per year to qualified projects. Since the program was established in 2004, it has granted more than $1 billion in incentives. Cuomo not only supports the Export-Import Bank but has proposed the creation of a state-based bank to provide similar benefits to New York-based businesses. Cuomo’s political career has been occasionally marred by controversial moments and some broken promises. Though Cuomo maintained he wasn’t speaking directly about Obama, the racial connotation of “shuck and jive” still echoed. Cuomo would likely face questions over the anti-corruption commission he established to pressure the state legislature to pass reform measures he favored. The commission was tasked with investigating New York politicians and political organizations for potential violations of state laws governing elections, ethics and political fundraising, but was apparently steered away by the Cuomo administration from investigations that could be damaging to him or to his administration.79 Shortly after these allegations were made public, Cuomo permanently disbanded the commission.80 He will also likely have to contend with the general perception that politics in New York is excessively corrupt – the top leaders of both the New York Assembly and Senate have both been indicted on corruption charges within the last year, and numerous other legislators have as well. Cuomo will also have to answer allegations that his tenure as secretary of Housing and Urban Development included loosening mortgage standards that later led to the 2008 financial crisis and that he used taxpayer dollars to promote his image and Democratic causes.